VOTED BEST Memphis Flat Rubber Roofing | TPO, EPDM, PVC, BUR, Rubber Roofing Services in Memphis, Tennessee - Beneficial Roofing | VOTED BEST Roofing Company, Call Us Today & See Why! 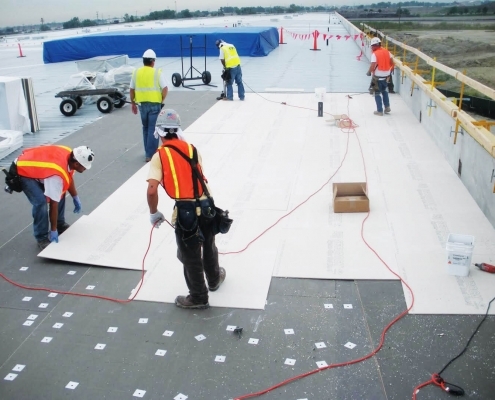 Flat rubber roofing is a common roofing system for tanks, and buildings, etc. It’s a highly effective roofing system when you’re looking to clear water off your roof and reduce energy costs, etc. In this roofing system, the membrane roofs commonly used are made of synthetic fiber, modified bitumen or thermoplastic, etc. While membrane roofing is a common application in Memphis, it’s increasingly getting embraced in residential roofing as well. Most residential complex owners prefer the flat rubber roofing option over the traditional roofing options because the former helps avoid leaks more efficiently. If you’re contemplating to cover your flat roof, it’s prudent that you compare the available roofing systems, and choose one which matches your preferences, and tastes. Some of the popular flat rubber roofing options you’d consider are TPO, EPDM, Modified Bitumen, PVC roofing, and BUR roofing, etc. To help you make a worthwhile decision on your purchase, we explore these options one by one highlighting some of the benefits, and potential disadvantages with each roofing system. Keep tuned. In the TPO roofing system, insulation boards are initially fastened to your roof’s substrate. Depending on your preferences you could buy TPO rolls then get them fastened on to the insulation boards mechanically. Either way, you could also have them fastened with the help of self-adhesive.The costs for TPO roofing are not constant and could range anywhere between $5 to $8.50 for each square foot roofing installed. 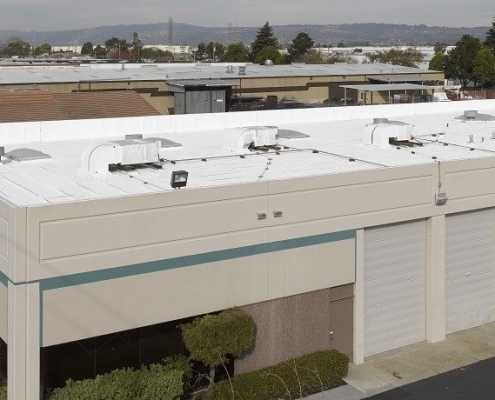 The major advantage of using TPO flat rubber roofing is that it’s available in white, and grey colors, therefore, a great option if you want to minimize energy costs since they reflect light. They also have welded seams hence ensuring durability. EPDM membranes are installed in a giant like stickers on flat roofing systems. While it may seem like a simple flat rubber roofing option for your structure because it occupies large spaces etc, EPDM membranes could form air bubbles between the membranes if poorly applied something which will expose the roof to early damages.EPDM membranes averaging 50″ by 200″ are a great option if you’re looking to get rid of leaking at the seams. On the contrary, handling them during operation is the most daunting task that requires a lot of precision. For the installation costs, EPDM flat rubber roofing system should cost around $4 to $8 for installation per square foot. The major advantage with EPDM membranes is that they’re affordable, and durable when properly applied. The major downside is that the dark ones absorb a lot of heat hence attract a lot of costs in terms of energy bills. A pretty labor intensive flat rubber roofing option that requires a lot of precision, and expertise. For installation, it’s commonly fixed in multiple layers which are torched to stick together. Usually, the torched surface is below the layers averaging around 0.75 turns of each roll.While a lot of cold-rolled technologies are today available for making this process seamless, Modified Bitumen still requires a lot of labor to roof the tar. The installation costs for this roofing option should average anywhere between $3 to $6 for installations per square foot. In PVC roofing, an insulation board is installed followed by a PVC membrane. The insulation board used in this case helps manage energy bills. Usually, the membranes are installed in 6″ to 18″ rows each welded on the seams.Either way, your contractor could fasten the edges mechanically to reduce labor bills by avoiding uplift. The installation cost for this system costs around $7 to $11 for installation per square foot. PVC membrane is strong and durable with a minimum breaking point of 300 pounds per inch. The white PVC membrane also reflects light hence boosting energy efficiency. 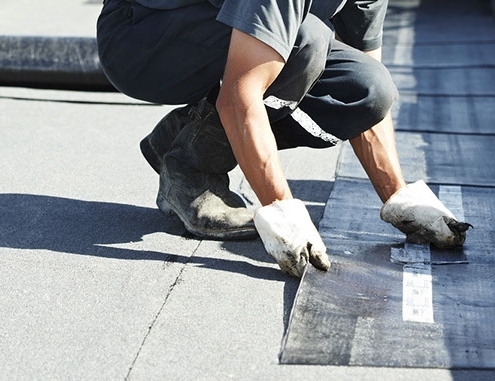 Also known as Built-Up Roofing, the installation of this option involves the application of many ply sheet layers attached together with hot asphalt. Normally, you could go with the reflective coating if you want to cut energy costs or use the gravel coating to ensure durability. The major drawback with this option is that it adds extra weight to the supporting material. What Can Influence Durability Of Commercial Flat Rubber Roofing? Some of the factors which are likely to affect the durability of your roof are; Installation & Climate. It’s prudent to have an experienced technician handle your roof. High humidity, and quick changes in climates could also affect the durability of your roof.